An overhead view of Tuzla Island in the Kerch Strait and the progress of the Kerch Strait Bridge, also known as the Crimean Bridge, linking Crimea and Russia, on March 5, 2018. Richard Lourie is the author of Putin: His Downfall and Russia’s Coming Crash. Better to build bridges than walls has become something of a mantra in these divisive times, but Russian President Vladimir Putin has cannily created a bridge that doubles as a wall. Known as the Crimean Bridge, it connects the Russian mainland to Crimea, a peninsula otherwise surrounded by Ukrainian territory, and, until now, supplied exclusively, and expensively, by air and sea. 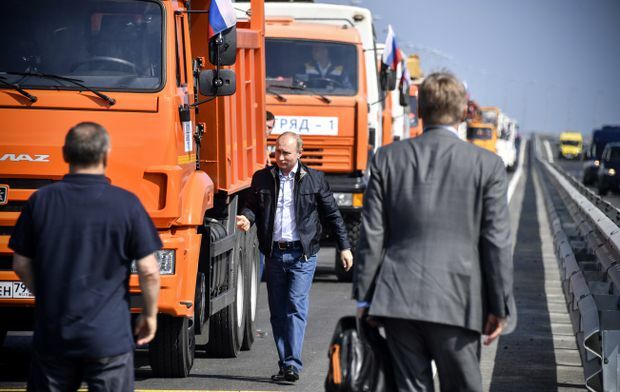 Designed for both vehicles and trains, the bridge was inaugurated in May, 2018, by Mr. Putin himself who drove a truck its length, which, at 19 kilometres, is now Europe’s longest. Though costs of course ran higher than anticipated, coming in at more than US$4-billion, the project was, amazingly enough, finished well ahead of schedule. That achievement was itself a sign of the importance Mr. Putin ascribes to the bridge whose construction he entrusted to Arkady Rotenberg, a martial-arts sparring partner from his youth in Leningrad. The sheer cost of the bridge and its political value to Mr. Putin demonstrate yet again why all attempts to pressure Russia into returning Crimea to Ukraine are simply futile. That Crimea is Russian is the rare point on which opposition leader Alexei Navalny and Mr. Putin are in agreement. It would be a fatal sign of weakness for Mr. Putin to give Crimea back – political suicide. 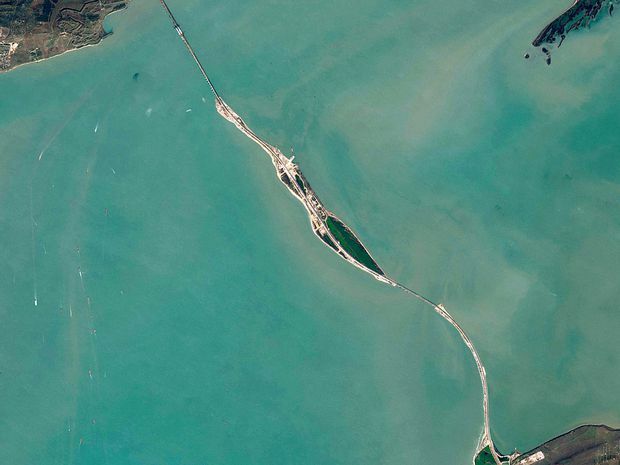 Just as the bridge connects the Russian mainland and Crimea, it also divides the Sea of Azov from the Black Sea, arching over the very narrow Strait of Kerch. The Sea of Azov is the world’s shallowest sea. Though that shallowness already made shipping difficult, Ukraine has two major ports on the Sea of Azov through which it exports steel and agricultural products. Now the very structure of Russia’s bridge across the Strait of Kerch limits shipping to vessels no taller than 33 metres. This has already reduced Ukrainian shipping from its Sea of Azov ports by approximately 25 per cent. There is no question that for Russia the Crimean Bridge is a vital national asset; an attack on the bridge is an attack on Mr. Putin himself, his power and his prestige. And there is also no question that it presents a large and obvious target, especially to Russia’s Ukrainian enemies, official and unofficial such as the volunteer Nazi-oid militia aptly known as the Azov Battalion. Mr. Putin has entrusted the security of the Crimean Bridge largely to the Russian National Guard, which has been called his personal army since its leader, Viktor Zolotov, Mr. Putin’s former bodyguard, reports not to the Minister of Defence but directly to the President. Russia is taking extraordinary measures to protect the bridge from attack from air, sea or underwater. The formidable S-400 anti-missile system is part of the defence system, as are combat divers with automatic weapons that can fire underwater. Unmanned underwater vehicles, drones of the sea, as well as hydro-acoustical systems will be used to detect enemy explosives and enemy divers. The Russians will be alert to any vessel approaching the bridge or seeking to pass under it. Acting in accord with a 2003 agreement with Ukraine, the Russians have been stopping all vessels and inspecting them at great length. Ships held up from docking at Ukrainian ports in the Sea of Azov are losing thousands of dollars a day and perishable goods are doing just that, perishing, on the docks waiting to be loaded. 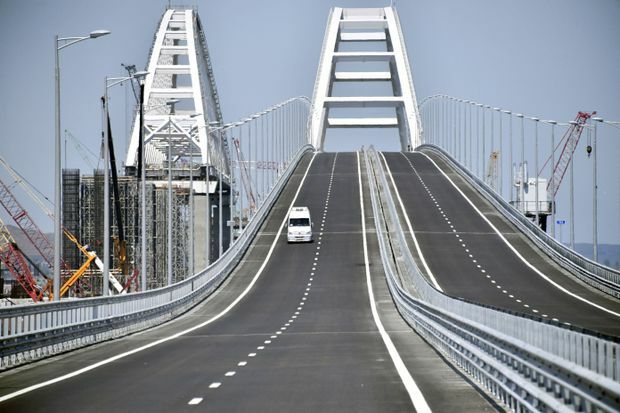 A vehicle runs down the 19-kilometre Crimean Bridge passing over the Kerch Strait on May 15, 2018, prior to the opening ceremony. Some analysts have already termed this a quasi-blockade and U.S. State Department spokeswoman Heather Nauert said on Aug. 30: “Russia’s actions to impede maritime transit are further examples of its ongoing campaign to undermine and destabilize Ukraine as well as its disregard for international norms.” And late last month, the U.S. transferred two former Coast Guard cutters to Ukraine for use in the Sea of Azov. Inflicting economic damage on Ukraine is a second, but just as important, use of the bridge. It’s an example of Russia using hybrid warfare not to crush an enemy, but to continually weaken him. Russia also held military exercises in the Sea Azov in May which inevitably encroached on Ukrainian waters. But the more tension the better, because Russia is seeking to create a new conflict zone that can replace the one in Donetsk where a low-grade civil war has dragged on for more than three years at a cost of more than 10,000 lives. The political situation in Donetsk is now fluid with Alexander Zakharchenko, the popular and, for Russia, sometimes difficult leader of the region having been assassinated on Aug. 31. Russia accused Ukraine, Ukraine accused Russia, while others pointed the finger at business deals gone bad. We will probably never know, but it doesn’t matter. What matters here is that now Mr. Putin has the opportunity to step in and act like a peace-maker, a statesman, in Donetsk. Ukraine holds presidential elections in March, 2019, and President Petro Poroshenko’s low numbers might be buoyed by a reasonable deal over Donetsk. For Russia, strategically, the most important thing is that Ukraine never becomes part of NATO. If that happened, Russia would be flanked, except for Georgia, around the Black Sea by NATO members. Small, non-violent border and shipping conflicts in the Sea of Azov would be enough to keep Ukraine out of NATO, which does not accept new members with frozen conflicts or border disputes. TOPSHOT - Russian President Vladimir Putin walks away from a construction truck after he drove the vehicle across the Crimean Bridge on May 15, 2018. The lifting of sanctions is of vital importance to Mr. Putin. A shortage of funds is forcing him to increase the retirement age by five years, from 60 to 65 for men and 58 to 63 for women. Here the rub is that in half the country’s regions life expectancy is less than 65. “We don’t want to die at work” has become a slogan of the countrywide protests that unnerve Mr. Putin more than those of the urban middle class and intelligentsia. The oligarchs are suffering too. No longer able to get service and spare parts for their private jets, they are being forced to sell them off, thereby losing both a symbol and an instrument of their power. The Russian writer Dostoevsky defined human beings as “ungrateful bipeds” and we can be sure that some of the oligarchs who are rich only because of Mr. Putin are now turning a jaundiced eye on him. So, Mr. Putin’s Crimean Bridge is a piece in a political game, one that both resembles chess as well as the bait-and-switch moves of three-card Monte. The bridge not only allows Mr. Putin to safeguard Crimea, it gives him a way to fuel a conflict with Ukraine in the Sea of Azov that in turn frees him up to play peace-maker in Donetsk. With the aim of getting sanctions lifted, Mr. Putin will thus go on something of a charm offensive but, make no mistake, it will be an offensive all the same.